Back to the outfit and it was a combination of greys and blacks with denim. I've been asked a few times about the sizing of the Next gilet and I can confirm that it comes up a bit big. Mine is a size 8 and has plenty of room for a jumper and coat underneath as I've worn it here. Perfect for a Saturday spent prepping for a few days away - I'm taking the girls to see my family in Tipperary while hubby stays at home. It's the first visit in 6 months (because of my back) so we're excited to see everyone again. While I'm away, the shop will be open but items won't go out until Thursday. To make up for the short delay, postage is free on all UK orders in the shop until midnight on Tuesday. For european and international deliveries, postage is discounted to £2 and £3 respectively. I love the mix up of textures between the leather and the gilet. I must remember to dig my leather jacket out and totally copy you! I miss wearing dresses as so few/none of mine are appropriate for breastfeeding. I'll live vicariously through your challenge! Love this look! 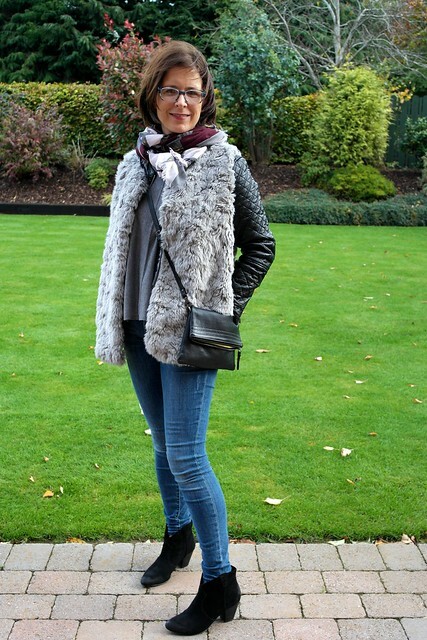 following this blog post I went and bought the gilet and wore it ALL weekend at Centre Parcs. Also stole the layering over the faux leather jacket too and really liked the look.